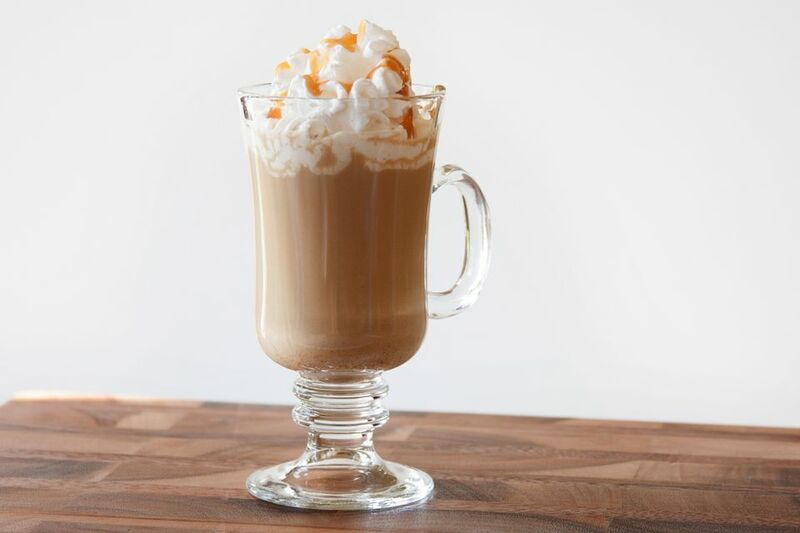 The caramel Irish coffee is a deliciously creamy hot coffee cocktail that you're sure to love. This recipe is a fun twist on the famous Irish coffee and makes a delightful after dinner drink. Created at Haven Rooftop, which looks down on New York City's Times Square, the drink is one that you can easily make at home. The recipe simply adds the luscious taste of Baileys Irish Cream and the sweetness of butterscotch schnapps to the Irish whiskey and coffee base. Top it with whipped cream and a drizzle of caramel, and you're ready to enjoy a dreamy cup of spiked coffee. Warm a mug or Irish coffee glass by filling it with hot water. Allow this to sit for a few minutes, then dump out the water. Pour all of the liquors into the warm mug, fill with coffee, and stir. Top with whipped cream and a drizzle caramel syrup. By preheating your glass, the drink will stay warmer longer. It's easy to do with the water from your teapot. Alternatively, you can heat the water-filled glass in the microwave for about 10 seconds. As with any coffee drink, the caramel Irish coffee is best with freshly brewed coffee. The liquors act as sweeteners and creamers, so the stronger your coffee is, the better your drink will be. Whipped cream in a can—such as Reddi Wip—is super easy to use and lets you create a beautiful mound on top of the drink. If you like a kitchen project, consider making your own whipped cream. It's easy and stores well so you can enjoy this drink a few days in a row. For the caramel syrup, all you really need is ice cream topping. Alternatively, you can use a syrup designed to flavor coffees, such as those made by Torani or Amoretti. Be careful with these because they may pour out rather than drizzle unless you have a pump-top dispenser on the bottle. Irish whiskey makes a true Irish coffee, but don't worry if you run out! Any style of whiskey other than a super-smoky scotch or a spicy rye should do just fine in this cocktail. Try it with bourbon or a smooth Canadian blend. If you're not a fan of butterscotch, try another liqueur as a substitute. A few that would work great are amaretto, a hazelnut liqueur like Frangelico, or an herbal liqueur like Benedictine. Chocolate liqueurs are a delicious alternative, too. Baileys is the most famous Irish cream on the market, but you can certainly pour any other brand and get a delicious cocktail. If you like, replace it with RumChata or a similar cream liqueur. How Strong Is the Caramel Irish Coffee? The caramel Irish coffee is a delightfully mild drink. Even with the three liquors, it has an average alcohol content around 13 percent ABV (26 proof). In the cocktail world, that's pretty low, and it's about the same as a glass of wine.